Pretty in Pink! Our PINK STRIPED CANDY WRAPPER is so pretty and fresh. 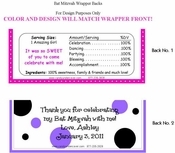 Perfect for the dainty Bat Mitzvah girl who loves to color her world pink.